These are standard humans. While they may well modify their existing form to advance their abilities, as far as DNA goes, they remain the original deal. Genetic modification and cloning being as expensive as they are, the vast majority of humanity, or what is left of it, tends to be Baseline. In certain circles, Baseliners do occasionally get mocked by those with more extensive genemods. Originally bred to exist in the low-G environments, of off-world mining Belters have been augmented to be extremely agile and have great stamina (the latter to offset the lack of natural stimulation of muscles by gravity). Belters tend to be weirdly tall and thin and often come across as gangly in normal G environments where, more often than not, they resort to bionic to compensate for their awkwardly lanky frames . The Harsenes have been engineered to be extremely intelligent and need less sleep than normal, having a great stamina to pursue their scientific curiosity. Culturally they greatly value knowledge and science and tend to be obsessed with finding the cause for anything unknown, especially the Catastrophe. This also brings them quite close to Colonist cultures. Harsenes are identified by large pupils that tend to cover their entire eye with strange amber hues. 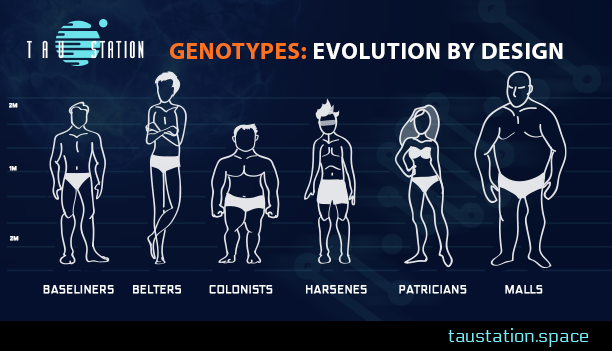 Though the genotype name tends to offend, the Patricians nonetheless get on well with almost everyone. Indeed, they were bred to. They usually have large eyes with almost sylvan, youthful looking features, and have a preternatural ability to put people at ease in a one-on-one situation. However, as a group, they tend to be mistrusted. Irrespective of this generalized discrimination, most people are quick to claim they count at least one “patsy” as a friend. “Mall” is said to be derived from the word “mallet.” As a genotype, Malls tend to be feared and mistrusted by most. They stand around two meters tall and are crafted for strength and stamina. They also tend not to be the sharpest tools in the shed. Oddly, while they can be fiercely loyal to individuals who earn their trust, they have little use for politics or the like. Virtually all Malls have extensive combat training, but little military training. They mistrust those who are quick to resort to violence, a common source of confusion for others.